I know, I know, it’s been a while… But at least I’m back, right? It’s not that I forgot about you, because I totally didn’t. Every weekend writing a post crosses my mind. But theeeeen I never do it. Oops? But here I am, sitting down at my computer and pretending I don’t have to revise an English essay, ready to share this recipe with you! I’m actually on mid-winter break right now, which seems to me to be a big waste considering we had two weeks off a month ago. But I won’t complain. Well, actually, I will. Because here’s the thing: I’m really bad at doing the whole vacation thing. Or, I’m really bad at using all my newfound free time to do productive, fun activities. And while the idea of some time away from stressful school responsibilities seems nice, usually I end up sitting around for a week feeling gross. Let’s just say I’m currently sporting two day old sweat pants and frizzy hair. These cupcakes came out of the same lazy break mentality. I wanted to bake (because that’s productive, yes?) but there were only limited supplies in my cabinet: no vanilla extract, only 1 stick of butter, no buttermilk or sour cream. Any normal person would, you know, go to the store, but that involves getting dressed and trekking through the snow (side note, why is there so much snow all the time, NYC?) and, as we previously discussed, I wasn’t really up for that. Cue sifting through my kitchen to find ingredients that at least kind of maybe make sense together. And that’s when I decided I would make olive oil cakes. Super easy to whip up (I’m talking two-bowl, hand-whisked easiness) and using everyday ingredients you already have in your kitchen, these little guys basically rock. They’re not overpoweringly olive oily, but still have a slightly fruity, subtly sweet taste. Citrus zest gives them a nice rounded flavor, and while oranges are usually used, lemons would definitely taste good too (or, if you’re me, random clementines you found in the back of your fridge). I paired half of my cakes with bittersweet chocolate frosting, and then sprinkled them with sea salt. 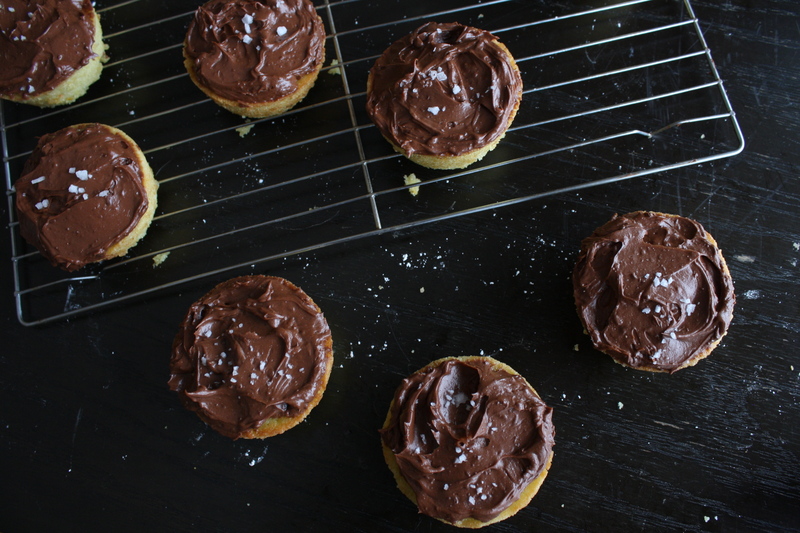 This sounds weird but they taste great: the frosting adds a sweetness and a richness that isn’t present in the cake. Plus I had a lot of chocolate sitting around my house. In regards to the sea salt: who do you think I am? 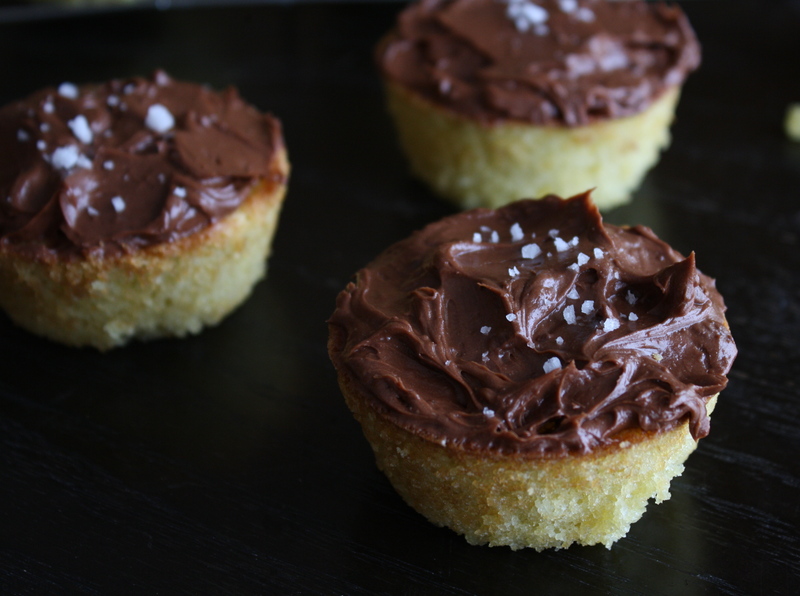 The salty crunch is a nice contrast to the cupcake. 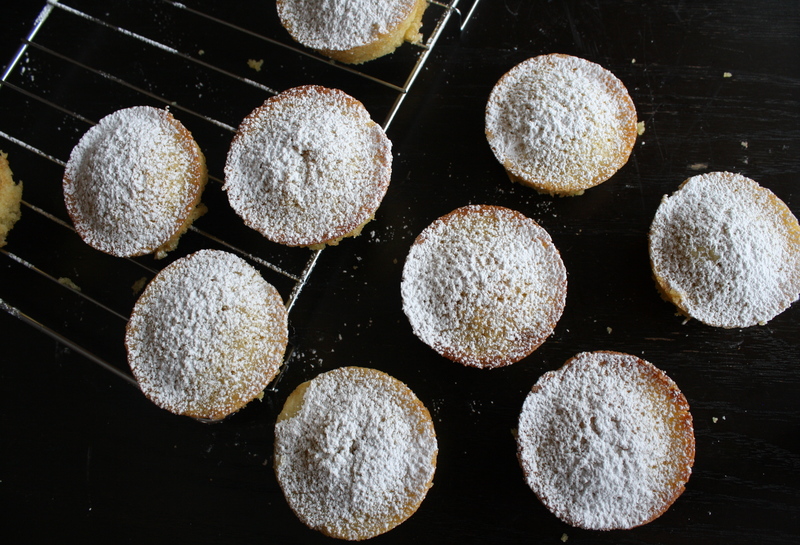 Of course, you could also eat these guys plain, or better yet: dusted with powdered sugar. I honestly think I prefer them better this way anyways. Like this they’re light and bright– perfect for breakfast or an afternoon snack. Seriously, who knew this could come out of a lazy Sunday? 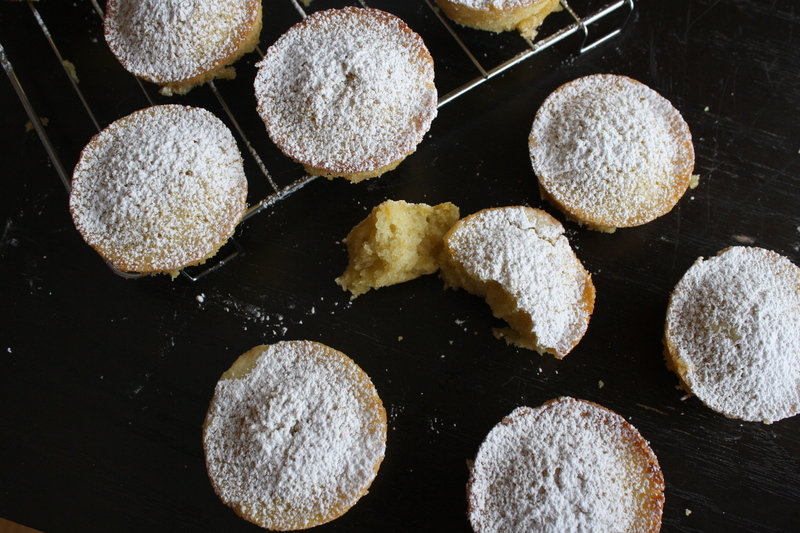 Bright, light and easy olive oil cakes. Slather with bittersweet chocolate or dust with powdered sugar. Preheat the oven to 350 degrees. Grease 2 cupcake pans, or fill with cupcake liners. In a medium bowl, mix together the flour, sugar, salt, baking soda, and baking powder. In a large bowl, whisk together the rest of the indgredients: the olive oil, milk, eggs, zest, and juice. Whisk in the dry ingredients until fully combined. 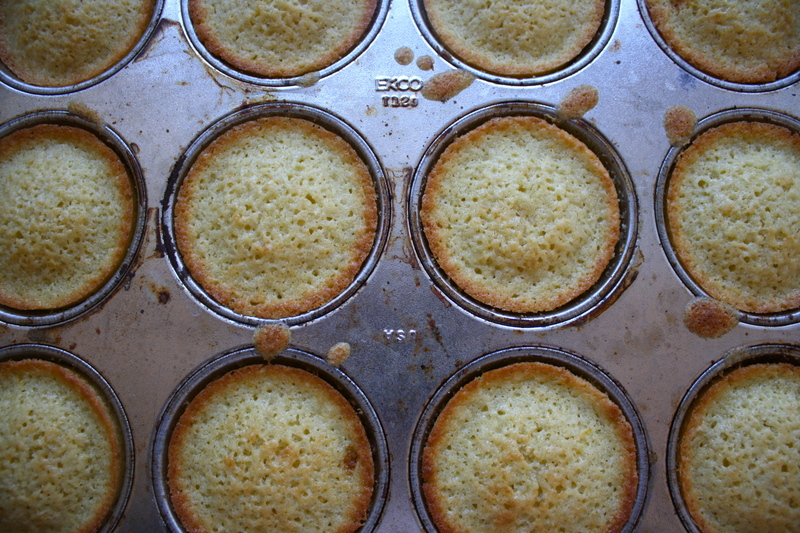 Scoop batter into the cupcake molds and bake for 20-25 minutes, until a cake tester comes out clean. Let cool in pan for 15 minutes and then invert onto a wire rack to cool fully. Frost with chocolate frosting or dust with powdered sugar. Cream together the butter and confectioners sugar. 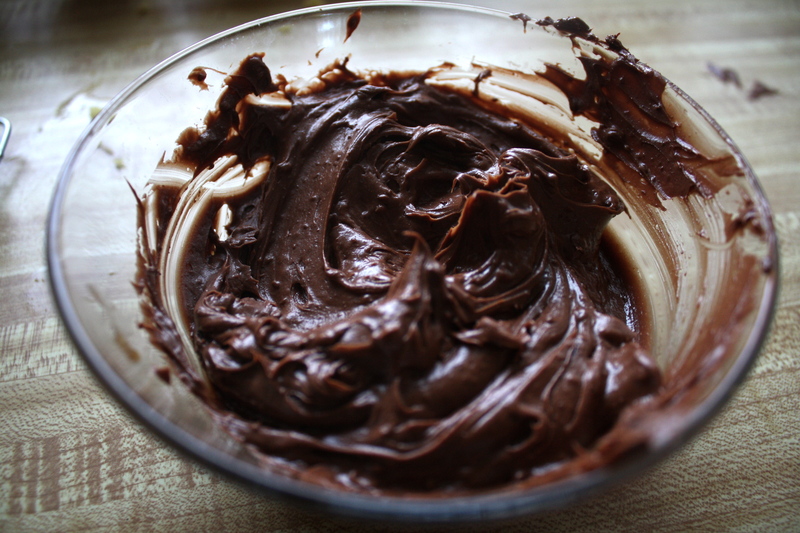 Add the cocoa powder paste and a pinch of salt. Beat to combine. Add the cooled melted chocolate and beat until smooth. If soupy, let chill in the fridge to stiffen.